This is a beautiful 1747 map of Denmark by the British cartographer Emanuel Bowen. It covers all of Jutland and the islands of Zealand, Funen and Lolland. Parts of Sweden and Germany are also included. Several important towns, rivers, roads, sea routes, cities and other topographic features are noted throughout. According to a note below the tittle, the sea coast in this map is based on an earlier chart by Van Keulen and the inland areas are chiefly based on the work of Delisle. 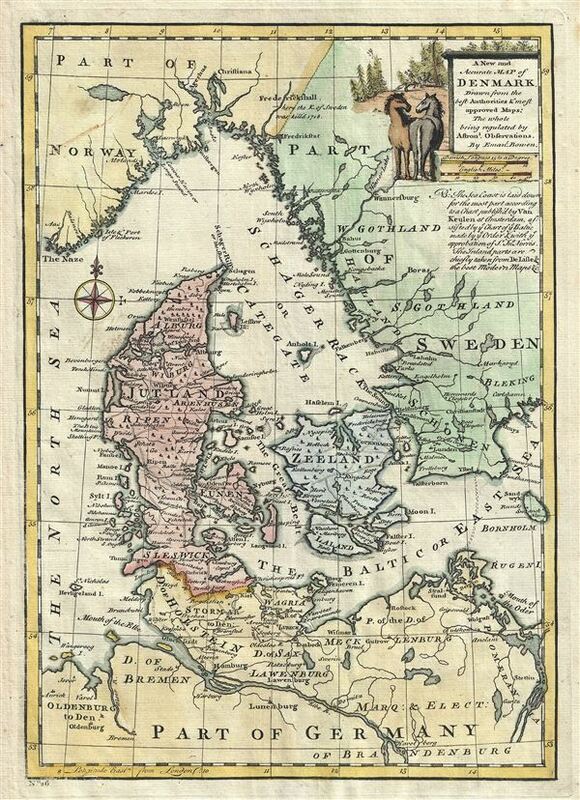 The map also identified Frederickshall (Fredrickshald) with a note reading, 'Here the King of Sweden was killed 1718,' referring to the death of Charles XII or Carl of Sweden, the king of Sweden from 1682 to 1718, who died under mysterious circumstances during his invasion of Norway. A title cartouche with beautiful illustrations of horses is included in the upper right quadrant. This map was prepared by Emanuel Bowen as plate no. 26 for the 1747 issue of A Complete System of Geography. Rumsey 3733.025. Philips (atlases) 614 (1752 edition).